Dazzle the crowd in JVN57782. This spectacular party dress has a sparkly bodice, covered in stunning beading and sequins, and a beaded, full-coverage racerback, with zipper closure. The subtle illusion scoop neckline, and tank straps, are featured over an opaque sweetheart bodice. The short, A-line satin skirt is finished with a beaded waistband, and side pockets. 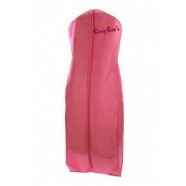 Become the star of the show in this dress at a Bat Mitzvah, Sweet 16, or Pageant.